We all need our little luxuries every now and then. I don’t mean great big luxuries like private yachts or a hotel chain named after you. Little ones like a sublime square of top quality chocolate or a dress that makes you feel like Audrey Hepburn. You know…the small stuff. In the realm of gastro-luxuries I have me favorites – foie gras, fancy French restaurants, really good chocolate, spare-no-expense sushi dinners…and Brussels sprouts. If you have been reading this blog for a while now, you would know that I absolutely adore this much-maligned vegetable. But a luxury? Brussels sprouts? Consider this: Over here, a small Styrofoam pack of about 300-400 grams of Brussels sprouts would cost me as much as one round of veggie shopping at the grocery. Want a clearer picture? Sigh…but perhaps it is the infrequent consumption that comes with its high price-tag that makes this little veggie so luxurious to me. After all, if you can have something everyday, doesn’t it stop being a luxury? So when I do splurge on Brussels sprouts, I like to treat them well. This lucky bunch got bathed in a splash of sweet dessert wine. – Heat some olive oil in a pan. – Add bacon when oil is hot and sauté until done but not too crisp. – Add sprouts and sauté until it starts to soften and get brown around the edges. – Cover pan for about 5 minutes or until sprouts are soft. – Uncover pan and add wine, deglazing and scraping at any brown bits on the pan. Botrytis is actually a disease that strikes the Semillon grapes. One type rots the grapes and damages the harvest. The other however, referred to as the “noble rot”, acts on the sugars and concentrates them…producing enticingly sweet and full-flavored dessert wines. We had some left over from a dinner party that I was planning to poach some fruits in, when I came upon the sprouts and the wheels in my head started turning. 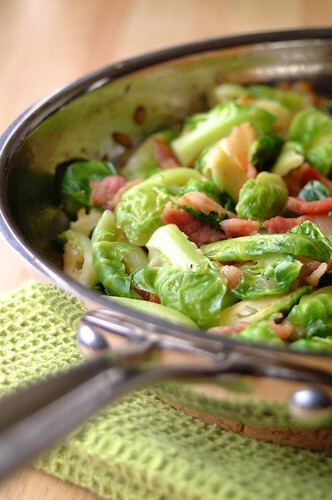 My beloved Brussels sprouts + chic dessert wine + smoky bacon = sweetly glazed luxurious sprouts and bacon deliciousness!